The case for identity cards has been branded "bogus" after an ex-MI5 chief said they might not help fight terror. 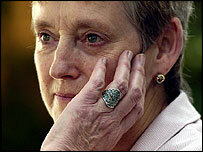 Dame Stella Rimington has said most documents could be forged and this would render ID cards "useless". The Conservatives said her comments showed the cards could be counter-productive. The Lib Dems said plans should be abandoned. Downing Street has so far only said Dame Stella is a private individual who was entitled to her views. Her comments came as the government suffered a House of Lords defeat on the ID card plans. Peers said only those who reasonably required proof should be entitled to ask for verification of identity when the cards come into use. The government has argued the cards scheme will help prevent terrorism, organised crime, illegal immigration and fraud. Dame Stella retired as head of MI5 in 1996 but gave her personal views on the cards at the Association of Colleges annual conference in Birmingham. She said: "ID cards have possibly some purpose. "But I don't think that anybody in the intelligence services, particularly in my former service, would be pressing for ID cards. "My angle on ID cards is that they may be of some use but only if they can be made unforgeable - and all our other documentation is quite easy to forge. "If we have ID cards at vast expense and people can go into a back room and forge them they are going to be absolutely useless. "ID cards may be helpful in all kinds of things but I don't think they are necessarily going to make us any safer." Conservative shadow home secretary David Davis seized on the comments, saying: "Yet again we see that the government's arguments for ID cards are completely bogus. "Stella Rimington would know better than any government minister the security value of ID cards. If Ian Huntley had had an identity card, would he have got the job at Soham school which allowed him to commit the murders? "What she has demonstrated is that they will be a spectacular and probably counterproductive waste of money - an unnecessary incursion on people's privacy." Lib Dem home affairs spokesman Mark Oaten said Tony Blair had urged MPs last week to listen to the experts on terrorism when he tried to garner support for new terror laws. "When someone of Stella Rimington's experience expresses these doubts, the government should listen and abandon this scheme before wasting any more taxpayers money," he said. "Tony Blair is always saying we should listen to the experts, this time he should be listening." Former government crime advisor Lord Mackenzie disagreed with Dame Stella's assessment, saying there were plenty of examples of occasions when ID cards would have prevented crime. He told BBC News: "Let's look at the Soham murders. If Ian Huntley had had an identity card, would he have got the job at Soham school which allowed him to commit the murders? I think not." But Shami Chakrabarti, director of civil liberties pressure group Liberty, described the former security chief's comments as "another nail in the coffin of the massive identity card folly". Calling for ID card plans to be scrapped, she added: "Sadly, the arguments that ID cards will protect the UK from terrorist attacks are largely unconvincing. "The men responsible for the 9/11 and Madrid terrorist attacks had valid identification."